No Place to Hide is Lynette Eason’s latest novel, and the conclusion to the Hidden Identity Series. When I started this book, it was hard for me to put it down until I finished the last page, and then only with reluctance. I have found that as soon as I meet the characters in Lynette’s books I feel an immediate connection. I love the depth of the characters that she creates, especially since they seem to have integrity and character, but are real enough to struggle with life like the rest of us. In this story the main character Jackie is thrust back in the life of a childhood friend when he is framed and labeled as a terrorist. The web of drama goes pretty deep though and it will keep you wondering and scratching your head! While you are not sure who the good guys are or the bad guys you sense pretty quickly the danger that is unfolding for Jackie and Ian, and through it all they struggle with who they can trust as they literally have no where to hide while they are trying to clear Ian’s name. I enjoyed the children’s characters in the story as well – they added a dimension of family and sweetness. Lynette Eason writes great stories that are straightforward, laced with strong (real life) christian elements, and lots of plot twists and turns! Her writing is always filled with suspense that will not let you go. I have always enjoyed reading her novels, and this one was just as expected – a great read! You may think you need to read books #1 and #2 however, while characters pop up from the past books, you do not have to have read the past ones to completely follow the third one. 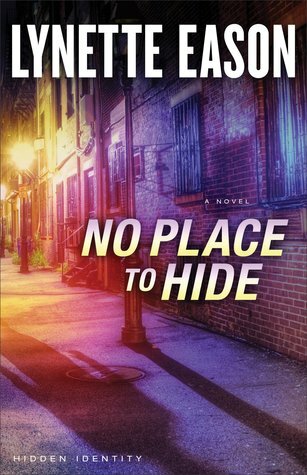 I highly recommend No Place to Hide – this would be a great series to read over the summer! NOTE : I was offered a copy of No Place to Hide in exchange for an honest review by Revell Publishers.